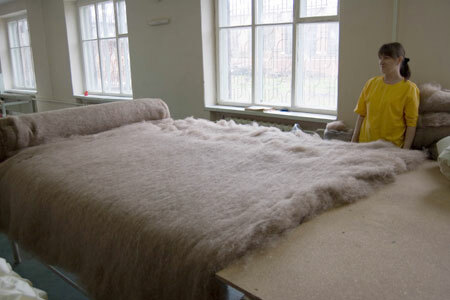 Factory Donskoy Textile is producer of quilt blankets, mattress toppers, pillows, socks from camel and fleece wool. Factory Donskoy Textile is producer of quilt blankets, mattress toppers, pillows, woolen socks. The factory was founded in 1996 in Aksai, Rostov region, Russia. At the time, it is a small but modern manufacture, producing very high quality products. We sell our quilt duvets worldwide. We offer our customers a very high quality blankets and pillows, mattress covers and socks. Ecologically clean materials used in the manufacture of products positively affect the health of our customers. Shop sells its products with delivery to any country. Naturally, most of buyers are from Russia, but the quality of our products has been already estimated at its true worth in USA, Europe and Israel, Australia and Canada. We often get positive reviews, they help us to make our products even better, treat them with love and respect.